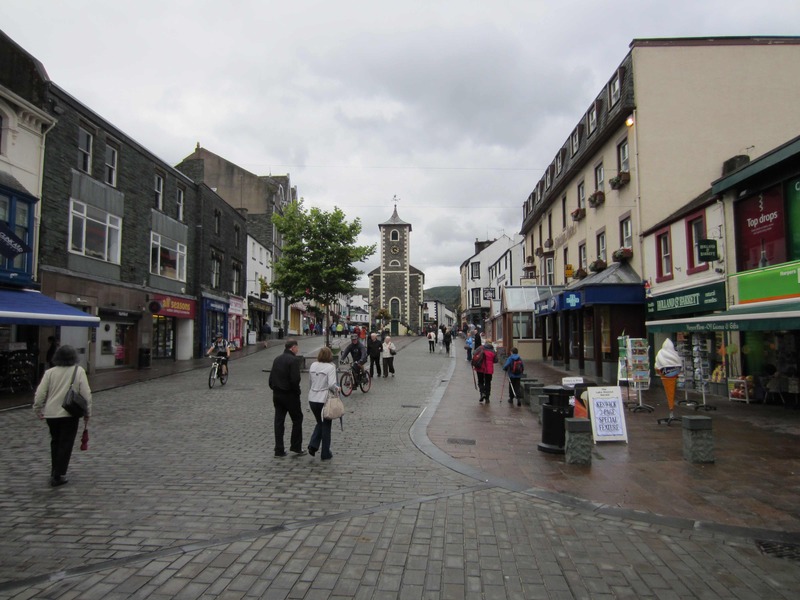 Keswick (pronounced “kezzick”) must surely be the walking capital of the world. As you pass through the old, cobbled market place in the centre of town, you float in a current of people wearing boots, stooping under backpacks and brandishing hi-tech walking poles. They sit sipping coffee in cafés, they huddle around maps, they stand in queues at the bus terminal. The centre of Keswick in mid summer. Note the two walkers right of centre. They also ebb and flow through the town’s innumerable outdoors shops. Keswick is a small town but it must have more outdoors shops than any comparable place in the world. Mountain Warehouse, George Fisher, Ultimate Outdoors, Rathbones, Sports Temple… they jostle along the main street and squeeze into side alleys. At this time of year business is booming. At 10.30 am on the morning of Sunday August 7th – yes, Sunday – a crowd of around 20 people were standing outside the front door of George Fisher’s (“The UK’s best outdoors store”) waiting for it to open. I know because I was one of them. I was on the hunt for a new pair of hiking socks, snared by the headline “The Joy of Socks” in the shop’s newsletter. On the opposite side of the street the bell of the old Anglican Church clanged in forlorn entreaty as a few elderly parishioners toiled up the steps for the morning service. 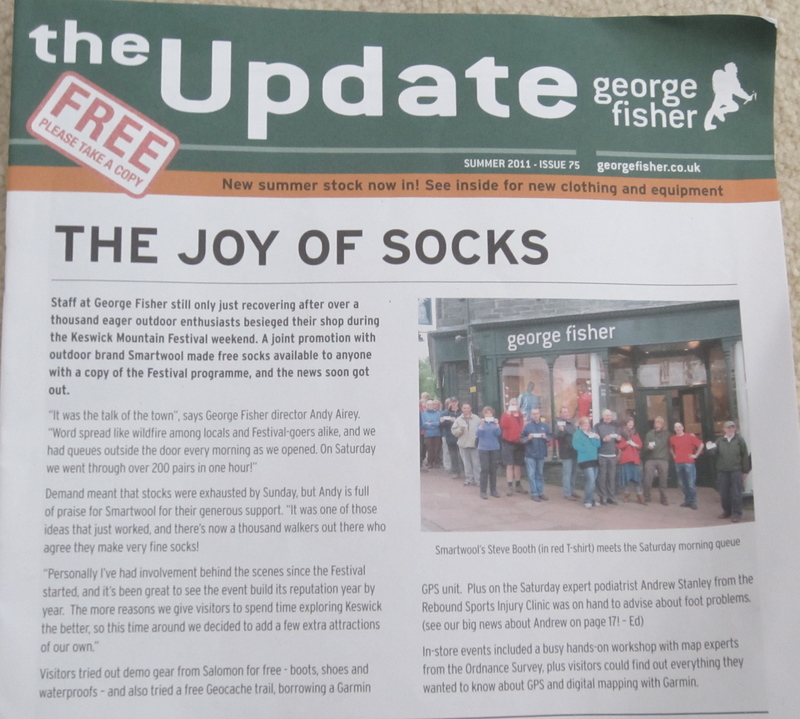 The irresistable page 1 story in an advertising newsletter of the George Fisher outdoors shop in Keswick. Keswick must also be the B-and-B capital of the UK. In most of the streets around the town centre every second house – almost literally – seems to be a bed-and-breakfast establishment, or a guest house, or a small hotel. As Emmy and I walked to our accommodation at the Latrigg Guest House we noticed only one or two “Vacancies” signs in the streetside bay windows. Mostly it was “No Vacancies”. In times past Keswick used to be famous as the pencil manufacturing capital of the world. There were abundant supplies of plumbago lead and wood in the surrounding hills. Today this industry has virtually disappeared leaving behind a lonely and slightly desperate Pencil Museum paddling hard against the tsunami of modern communications technology. We had scheduled a rest day in Keswick and we decided to fill it with a bus trip to nearby Grasmere. At the bus terminal I bent to peer at a timetable on the pole of a bus stop. An intense voice spoke into my ear. I straightened and saw beside me a smallish woman, about 40 years old with short blond hair, a pale complexion and pinched, lined features. I apologised and moved to the other side of the woman standing beside her. I made myself as inconspicuous as possible on the left hand side. The bus, a double-decker, lumbered into sight. The woman pulled her lips inside her mouth, clenched her fists, and stomped aboard. I saw her again sitting in the front seat on the top deck of the bus. An American couple – both walkers – were sitting across the aisle. They had placed their backpacks on the seat behind them. Emmy and I took the seat behind the backpacks. The angry woman half rose in her seat, turned and looked fiercely at me, jabbing her forefinger in the direction of the backpacks. When I failed to respond with anything better than a smile, she snapped around and sat glaring out the front window, her body clenched rigid. Angry. Just between you and me, dear reader, (I have to whisper here) this is pretty undistinguished poetry. 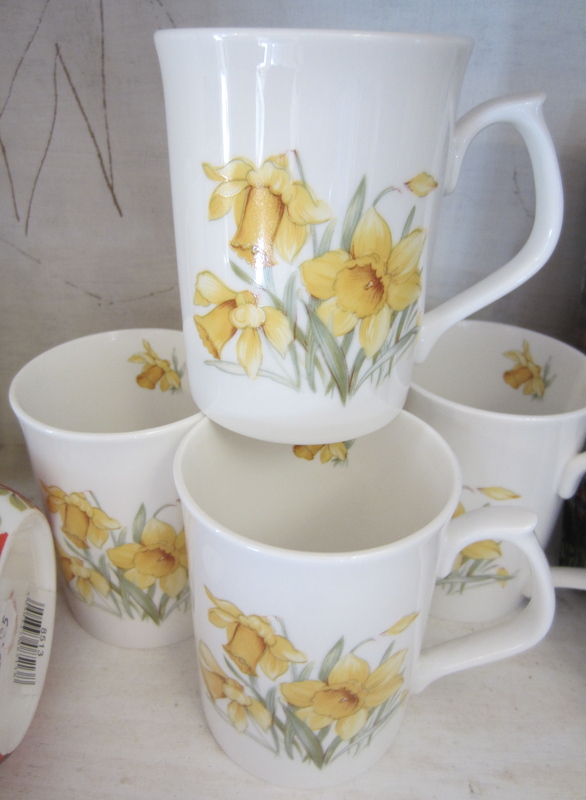 But the “golden daffodils” industry will not brook any quibbling about aesthetics. There is an image to be promoted and money to be made. The gift shop at Dove Cottage was stuffed with tea towels, fridge magnets, special editions of the poet’s works, thimbles (thimbles? …for thimble collectors, of course), mugs, umbrellas, stickers, illuminated pictures, soap, CDs, tea cups, vases, coasters, place mats, postcards, key rings, note books, sachets of perfume, aprons, oven mitts, tea pot cosies, pot holders, book marks, pen and pencil sets, condoms (sorry… cross out that last item), all with golden daffodil motifs. Daffodils have become a mythologised tag super-glued to the name of Wordsworth. But despite my ungenerous thoughts about daffodils, I did enjoy the visit to Dove Cottage. The cramped rooms with their low ceilings, rough wooden beams, dark wainscoting and small windows have been carefully preserved more-or-less as they were 200 years ago. The floorboards creak as they did 200 years ago, an ancient clock ticks loudly and chimes as it did 200 years ago, the garden still produces vegetables as it did 200 years ago. The house is still “alive” despite falling into the hands of conservationists. We returned to Keswick refreshed and looking forward to the challenge of the next day’s walk. But when we awoke at six o’clock the following morning a strange darkness filled our room and there was a scratching noise at the window. I pulled aside the curtains. Heavy rain was washing over the stone houses of Keswick. Visibility was down to 100 metres. The temperature was 14 degrees and struggling to get higher. Emmy and I looked at each other and experienced one of those all-too-rare moments in a marriage when there is instant silent understanding and instant silent agreement. We would not be walking over the lunar scrabble of High Pike (658 metres) that day, or any other day. 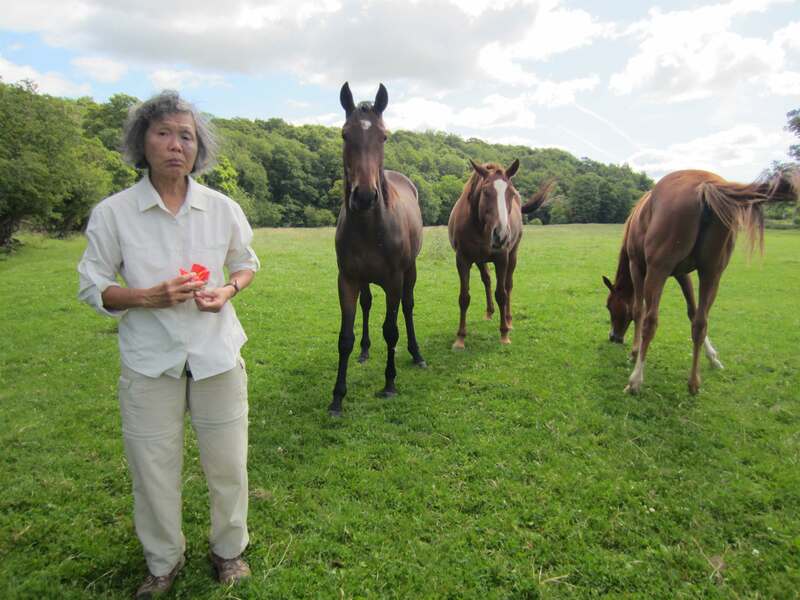 Curious horses interrupt Emmy as she takes a break on the walk to Carlisle. For us, the last leg of the Cumbria Way began the next day in the hamlet of Caldbeck, a taxi ride past High Pike. 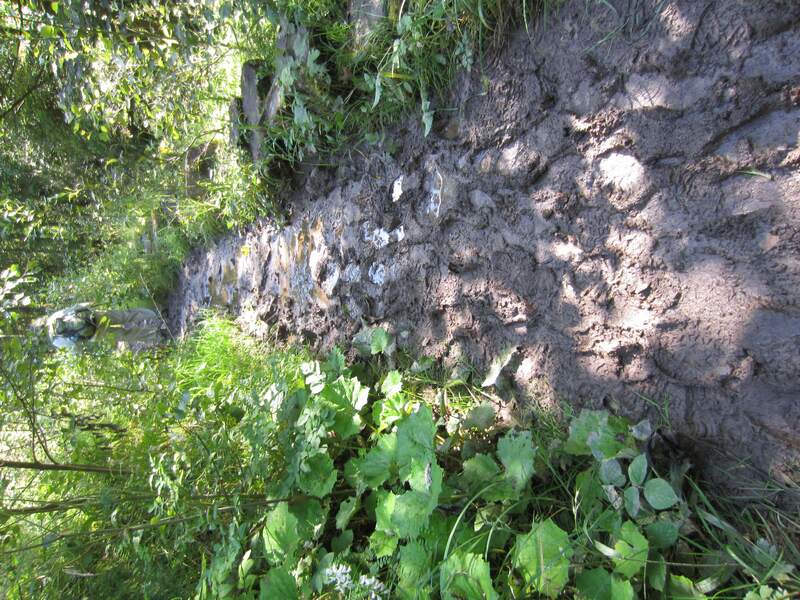 The weather was clear and warm, but the path sodden and slippery with rainwater from the previous day. In places it was ankle-deep in mud. We pressed on through sparkling woods and fields, shooing away curious horses and leaning aside to avoid drenching ourselves in the dew of tall purple wildflowers. A grey heron-like bird jumped from a stream and flapped slowly into the long grass of a neighbouring field. Rabbits and squirrels played across our path. The muddy path left behind by the previous day’s heavy rain. Mid afternoon the outer ranks of Carlisle’s estate houses came into view and, with 23 kilometres behind us for the day, we walked into town past the low grey walls of Carlisle Castle. We had done it! 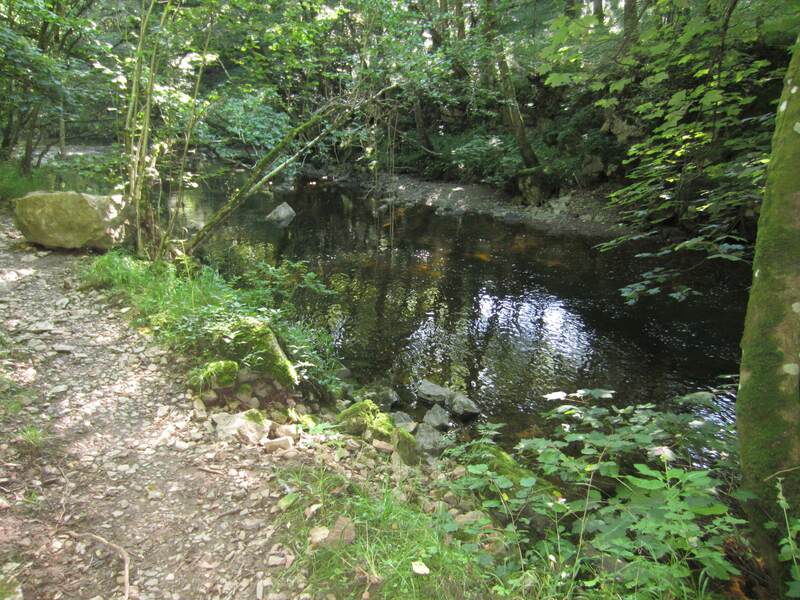 We had walked the Cumbria Way (well… most of it). Back at the Langleigh Guest House I noticed a button hidden in the ivy beside the door. I pressed it. It triggered a frenzied outbreak of barking inside the house. The door opened and a middle-aged gentleman appeared momentarily before being knocked aside by two knee-high spaniel dogs. “I hope you’re all right with dogs,” he said cheerily, trying to stay on his feet while the dogs hammered at his legs. “No problem at all.” I had a sudden memory of the delicious meal of dog-meat gulai stew I had enjoyed in Solo, Central Java. “I just love dogs,” I said truthfully. The two dogs sat on their haunches and looked up at their master with mournful spaniel eyes. They had heard these jokes before. The following morning we went down to the breakfast room, weaving around the dogs as they raced up and down the stairs, sticking their heads through the banisters and yapping in our ears. In the breakfast room our host was clinging to the mantelpiece as he tried to keep our bacon and sausages away from the dogs. Under the table the dogs snuffled around our legs. And i’m glad reasing your article. But hould remark on few general things, The site styhle is great, the articles is really great : D.